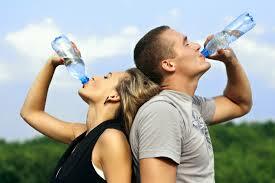 The average adult loses about 2.5 litres of water daily through perspiration, breathing and elimination. If your body is not sufficiently hydrated, the cells will draw water from your bloodstream, which will make your heart work harder. At the same time, the kidneys cannot purify blood effectively. When this happens, some of the kidney’s workload is passed on to the liver and other organs, which may cause them to be severely stressed. Additionally, you may develop a number of minor health conditions such as constipation, dry and itchy skin, acne, nosebleeds, urinary tract infection, coughs, sneezing, sinus pressure, and headaches. So, how much water is enough for you? Each person has to drink enough water determined by their weight, how active you are and other measurements. The Institute of Medicine determined that an adequate intake (AI) for men is roughly about 13 cups (3 liters) of total beverages a day. The AI for women is about 9 cups (2.2 liters) of total beverages a day. This amount of water is roughly in line with the popular “8 glasses a day”. Eight glasses of water is more or less 1.9 litres of water and is an easy number to remember. However, if you want to determine exactly how much water you should be consuming, you should find a “water intake calculator” online, where you can enter your specifics to calculate exactly how much water is adequate for you. Moistens tissues such as those in the eyes, mouth and nose. Helps dissolve minerals and other nutrients to make them accessible in the body. Drink water throughout the day, so that you do not need to take it all in at once- this actually puts strain on your kidneys. You will surely reap the benefits of drinking enough water as part of your lifestyle!